Just days after the royal wedding, England’s Prince Charles visited D.C.’s largest urban farm. Common Good City Farm is a farm and education center that grows food for low-income Washington D.C. residents and encourages members of the community to volunteer. Amanda Formica works at the farm every Tuesday and thinks Prince Charles is a fitting ambassador for sustainability. “England is way ahead of the U.S. as far as its commitment to sustainability and global warming and creating green spaces,” says Formica. 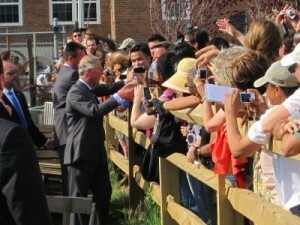 Prince Charles took time out of his farm tour to visit with community members standing outside the wooden fence. Urban farming is cropping up throughout the city; just last month non-profit Bread for the City began work on “the largest” rooftop vegetable garden in the District. All too often the question of food sustainability and environmental sustainability, it’s actually a really elitist conversation in that the people who are talking about it are the ones with the resources to experiment and buy high-end produce. We don’t think it has to be that way…. And it’s important for us to create at least one space for that. Common Good City Farm is another space for that, as well.